When you think about the many ways that technology has shaped your life, what comes to mind first? Maybe it’s faster communication, or lifesaving healthcare. But what about fruit salad? It’s easy to forget, but with today’s complex food supply chains there are some surprising technologies behind many of our favorite meals—even the simple things we enjoy every day. Take a closer look at that fruit salad, for example. How did it arrive on your plate? Whether you’re at a brunch in Boise or a picnic in Paramus, chances are good that many of its ingredients traveled a bit to get to you. Let’s say you’re enjoying strawberries from California, apples from Washington State, blueberries from Maine, and melon from Mexico. Delicious! And pretty ordinary, too. These days, we’re accustomed to enjoying a diverse mix of healthy produce any time of year. But as our grandparents and great-grandparents can attest, it wasn’t always so easy to find peaches in January. So how have we gained access to our favorite fruits, all year round? That’s where technology comes in. Each delicate crop must be harvested and transported quickly to prevent spoiling or bruising during its journey to you. Air freight has made it possible for that precious cargo to arrive in your neighborhood faster than ever before. Read the full article here. 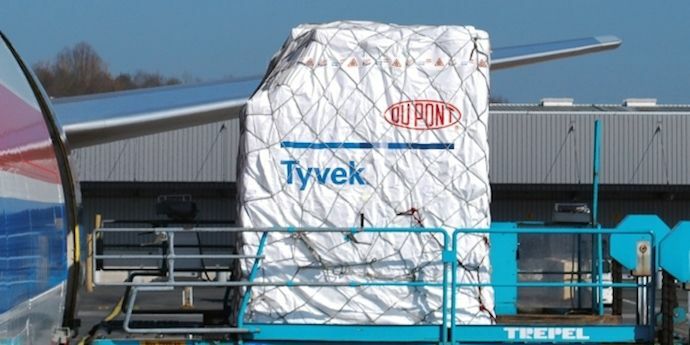 For more information about Tyvek® Cargo Covers, view this video – A World Without Food Waste.